High Quality Content by WIKIPEDIA articles! The name of the city of Pittsburgh, Pennsylvania has a complicated history. 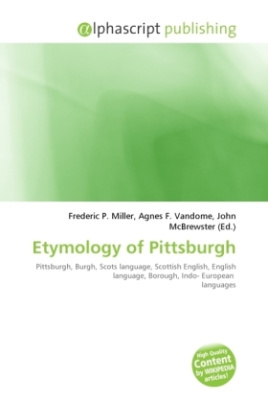 Pittsburgh is one of the few U.S. Cities or towns to be spelled with an h at the end of a burg suffix. Burgh is the Scots language and Scottish English cognate of the English language borough, which has other cognates in words and place names in virtually every Indo-European and Semitic language, as well as others. Inside of the rotunda of Union Station in Pittsburgh showing the spelling as of 1900. Pittsburgh (A French fort originally called Fort Duquesne) was captured by British forces during the Seven Years War. The earliest known reference to the new name of the settlement is in a letter sent from General John Forbes to William Pitt the Elder, dated 27 November 1758, notifying Pitt that his name had been given to the place. In that letter, the spelling is given as "Pittsbourgh." As a Scotsman, General Forbes probably pronounced the name "Pitts- burro," similar to the pronunciation of "Edinburgh" as "Edin-burro.